Dates: 3rd, 10th, 17th, 31 Oct; 7th, 14th, 21st, 28th Nov; 5th Dec. Dates: 4th, 11th, 18th Oct;.1st, 8th, 15t, 22nd, 29th Nov. 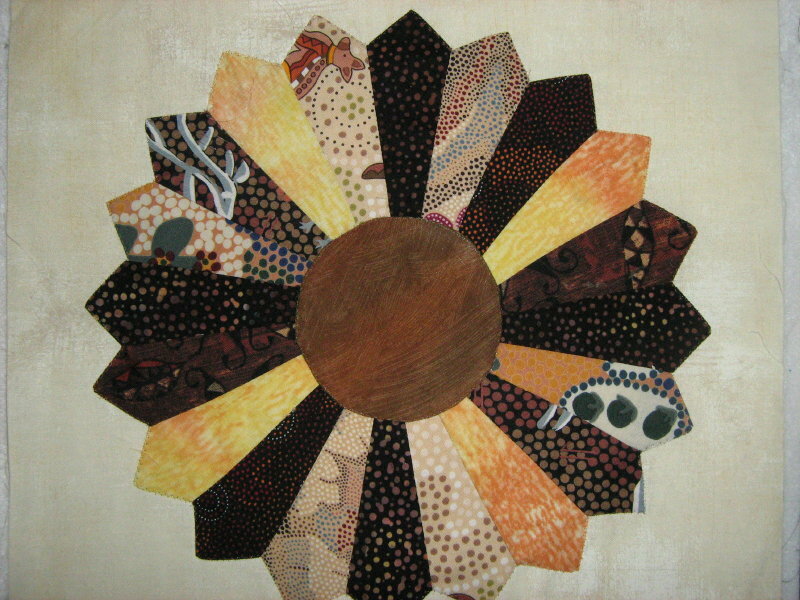 Eight fast and fun classes which introduce the basics of patchwork and quilting. £130 – avoiding holidays. * last session concentrates on quilting with your walking foot! 40 hours of classes. Taking you further into this wonderful craft, the course explores and introduces you to new techniques and challenges. You must be a confident beginner and understand basics of piecing, cutting and how to put a quilt together. Check out these course where they are listed to your right! Well I really have to get better at WordPress – but it takes so much time to make a page – I know, if I were better, gosh, I could do a class – I would be faster at page making. So I haven’t cracked how to text wrap around photos – or for that matter how to make a gallery, yet, because that would be really useful when it comes to my classes: just open a gallery and put their work in- how super would that be? 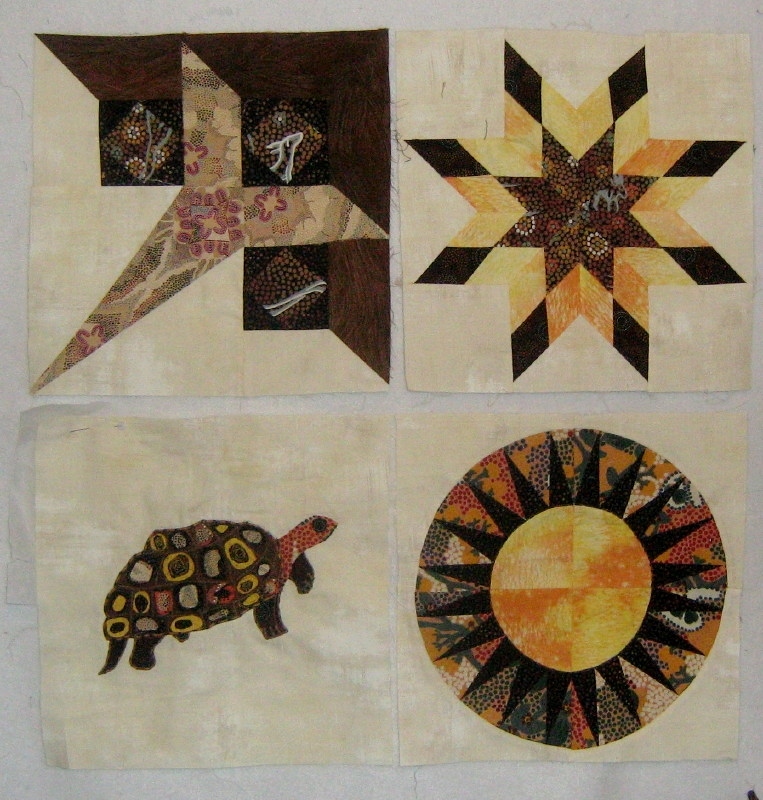 These are the Bouquet block, Lone star block, my applique block(unfinished as yet) and the New York Beauty block. I love my fabrics – Australian (and by the way, it is an Australian turtle as well); They are all 12 1/2″ blocks and we will be assembling the quilt after the October class. 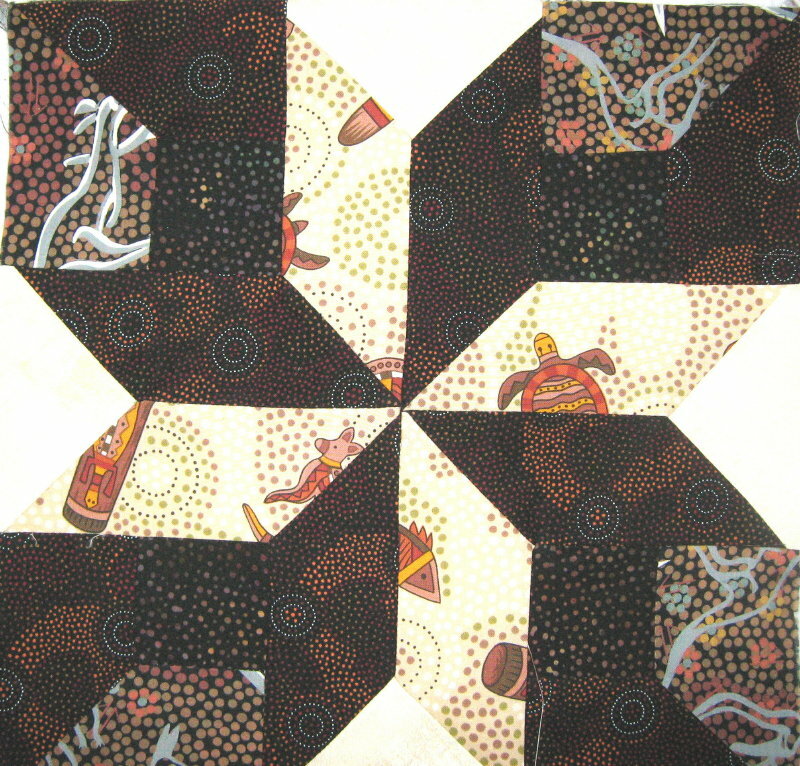 I think I will keep to the same techniques/blocks – strip piecing; foundation piecing; inset seams; applique; stars and circles, etc. unless at the end, the present students recommend otherwise! Each one of the class, is using such fun fabrics and taking advantage of them as well. Busy week – madly trying to finish my Becolourful quilt by Jacqueline De Jonge, and it is coming along but not fast enough. I have also been getting ready for two classes – Beyond Beginners and particularly the Beginner class that started on Tuesday – they have so much to learn in that first session, it is amazing they can stay the 3 hour pace. In Storrington Quilters we are making a Winter quilt with penguin appliques – and real penguin appligues, not childish ones – there are 17 different kinds of penguins, and we hope to include them all. I am off to Cyprus for a week for sun, swimming, reading and relaxation. I will need it since the week I get back is just as busy. several of you suggested you would love to do the course, but couldn’t commit for various reasons. So I have opened the individual sessions to those of you who may be interested in joining a one off session on say, Sashiko or Bargello. I expect it will be popular so will send out an email to tell people and hope that it brings results. In the meantime I have been working on my Wedding Ring Block and have several bits ready to put together. The Intermediate Quilting Class is working on the basis of making 12″ blocks and some of the instructions about do not work on that scale – say if they are making a whole quilt. Thank you Anja Townrow for your tutorial in the British Patchwork and Quilting Magazine. It is proving very useful. I must be getting on with my own Celtic Knot block so it is ready for the class on the 28th February. Will put some photos in as soon as I have them. If you are interested in any of the techniques I am offering – keep a watch on my blog for when I advertise the dates.